The history of Illinois is varied. The French first controlled it in 1678; the English had it beginning in 1763. The state of Virginia controlled it from 1778 until 1784, when the U.S. Federal government gained control. Finally in 1818, the land was created in the state we know today. For those with Illinois ancestors, the places to research online and in person are many. These resources provide not only genealogical data, but also historical data and social history. It is important to include all these aspects when researching your family's history. The Illinois State Archives is located in Springfield, our state's capitol. The archives holds many valuable records for researchers, including census records, military records, vital records, and land records. Some of these resources can be searched online through one of the many databases provided by the archives. The Illinois State Archives will conduct some research for individuals while other things such as death certificate research, must be done in person. The Illinois Regional Archives Depositories (IRAD) are regional branches of the Illinois State Archives system. Each region is made up of several counties and their records. IRAD branches are found in university libraries around the state. The record holdings vary between branches, but typically contain vital records, probate, land, tax, and mortgage records, municipal records, court records, election registers, and some City of Chicago records which pre-date the Fire. There are seven IRAD branches in the state. Researchers can search the Local Government Records Database on the IRAD website to locate the branch which holds records for the county in which their ancestors lived. Searches can be conducted by the county in question or a record set title or by choosing the appropriate branch, if known. If you do not live near the IRAD branch you would like to obtain records from, you can send them a letter with up to two requests. The turnaround time is usually within a month. There is a small copy fee for each request. The Illinois State Library, located in Springfield, houses a vast number of resources in the form of books, maps, databases, and genealogy information. The Illinois State Library administers the Illinois Veterans History Project, which seeks to create a permanent record of those men and women who served our country and lived in Illinois. There is a patriot database that can be searched on the website listing information on those veterans who have already been entered. Forms can be downloaded from this website, completed, and mailed to the library for inclusion in the database. Once the forms are processed, the family receives a certificate of appreciation for their participation. The library also hosts the Illinois Digital Archives, which is a repository of digital collections housed at the Illinois State Library and other Illinois institutions and libraries. Links are provided to the individual repositories and a search function is available to search for general keywords or themes. The collection hosts Illinois and Federal governmental documents, photographs, maps, newspapers, videos, oral histories, manuscripts and other materials relevant for both genealogists and historians. This collection can be used not only to locate family information, but also to gather social history information to add to a family's story. The Abraham Lincoln Presidential Library is located in Springfield, near the Old State Capitol building. The library holds manuscripts, an audio-visual collection, newspapers from across the state spanning many years, printed materials, and an oral history program. The newspaper collection is on microfilm, which can be loaned out to a library near you. Librarians will conduct research for a small fee as outlined on their website. To learn more about the libraries holdings, view the list of Collection Guides and Bibliographies. The library is also known for its collection of Civil War materials. These materials are held for both Union and Confederate soldiers in the form of printed materials, manuscripts, maps, and family genealogies. The National Archives at Chicago is one of the many NARA branches across the country. Its holdings include census records, naturalization records for the U.S. District Court of Chicago, court records, printed materials, and other genealogical resources. The NARA branch in Chicago also offers workshops on both genealogy and history. Details can be found on their website. The Newberry Library is located in Chicago. This a non-circulating independent research library is known for its enormous collection, spanning six centuries, including rare maps, books, manuscripts, music, and other materials. The Newberry is beneficial to anyone researching Illinois ancestors and ancestors from almost anywhere around the country and world. The Newberry Library's research guides and online catalog are the places to start to see what treasures it has for your research. The Digital Resources page contains a database of scholarly works and websites. The Genealogy and Local History section contains resources for those who wish to visit the library to conduct research. The Newberry Library will conduct some research submitted via phone, mail, and email. The library also offers many programs on-site for history, genealogy, and the arts. These programs change quarterly. Illinois Harvest is a project created by the University of Illinois at Urbana Champaign to serve as a gateway to digital collections within the University of Illinois system and provide access to scholarly resources within and outside of Illinois. The collections are broken into image and text, which can be searched. New items are added regularly. This is a valuable resource for anyone researching Illinois ancestors and history. 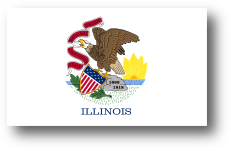 The Illinois State Genealogical Society (ISGS) strives to provide resources in print and online for Illinois ancestors. Some resources are available to anyone who visits the site while others are for members only. Members benefit by receiving a quarterly journal, which contains book reviews, ancestral stories, photograph questions and tips, and various indexes. A monthly newsletter is also sent to members. Non-members benefit from the resources available on the website and blog. There are also free monthly webinars available to anyone. ISGS hosts an annual conference each fall. The location changes year to year, as do the speakers and theme. The ISGS website houses many free databases such as Ancestors Photos, Prairie Pioneers, and Military Certificates. There are resource pages, links to society blogs and pages, other societies and repositories. There is a calendar of events, a forum to discuss various genealogical topics, and a section with downloadable forms. There are new resources being added on a regular basis so it is always a good idea to check on the website from time to time. Beyond the major institutions and libraries discussed here, other Illinois resources include county courthouses, historical societies and museums, local genealogical societies, and both public and university libraries. Check out all of these options when researching your Illinois families. You may uncover a goldmine of information in the next place you look.